To cook a whole chicken is really a challenge. If the chicken thigh is cooked, the other parts might be over-cooked and the meat turns tough. When it comes to cook the whole chicken in soy sauce, it yields experiences and skills to control the heat and cooking time. I found it’s much easier to get satisfied results with this cast-iron casserole. It heats foods evenly and retains the heat inside for longer time. The cast-iron casserole is extremely good for slow cooking. So I used it to cook the popular Chinese dish, soy sauce chicken. Traditionally, the amount of soy sauce that has to be used is quite a lot. It has to cover the whole chicken. Having done the cooking, it’s a problem of how to recycle the soy sauce as it’s too much. With the cast-iron casserole, the cooking calls for smaller amount of soy sauce that easily consumes, either for going with white rice, or frying noodles. It’s extremely yummy! Soak tangerine peel to soften and rinse well. Set aside. Rinse chicken and pat dry with paper towels. Place half of the spring onion and ginger into the chicken cavity. Rub wine all over the chicken. Tie chicken legs together with a string (as picture shown). In a large casserole, heat up some cooking oil and sauté ginger, garlic and spring onion. Pour light soy sauce, dark soy sauce and water into the casserole. Add tangerine peel. Bring to a boil. Add rock sugar and slower the heat to low. Carefully place chicken into the casserole. Beware that the heat should be as low as enough to keep little bubbles springing up. Don’t use high heat because the chicken would be over-cooked easily and the meat won’t be smooth and tender otherwise. First, place chicken’s breast down for 10 minutes, covered. Turn chicken’s back down for another 8 minutes, covered. Turn chicken to left, leg to the bottom, for 13 minutes, covered. Then turn chicken to right, leg to the bottom, for another 13 minutes, covered. Remove the lid, turn chicken’s breast down to the bottom again. Cook over high heat until the sauce boils vigorously again. Cover and turn off the heat. We’re going to use the heat inside the casserole and continue to cook the chicken for another 20 to 25 minutes. Test the chicken if it’s cooked through or not. Insert a needle or chopstick into the thickest part, like chicken thigh, if clear liquid runs out without any blood, it’s done. If it's not cooked, then heat the sauce for a few minutes more. Transfer chicken to a platter and wait until the juice absorbs, about 5 minutes. Discard the ginger and spring onion inside the cavity. Cut into bite-sized chunks. Ladle hot soy sauce over the chicken. Serve hot. The cooking time depends on how big the chicken is. The level of heat is also crucial. Practice makes things perfect anyway. 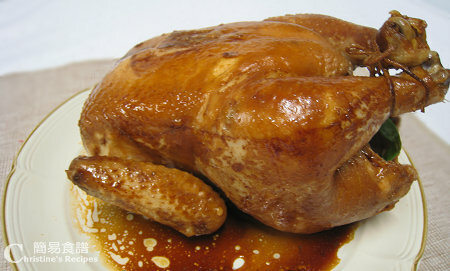 Every time you turn the chicken, baste with the soy sauce to keep the whole chicken moist and add colour evenly. Use half of a chicken or chicken legs if you like. It’s much easier and needs shorter cooking time. This looks amazing, it makes my mouth water, I'll try that for sure! Our family loves this chicken, very juicy. Worth trying. I agree with you that cooking the whole chicken is a really challenge. This is why I have never attempt it. Hehehe! Judging from your cooked chicken, you have done a great job! What a healthy meal for the day! In this post, the 2nd paragraph, I've already provided a link that leads you to take a look of how a cast-iron casserole looks like. Just click it. Thanks and welcome you back. Your soy chicken looks AMAZING, Christine. I buy this from Asian market to serve with a simple stir fry veggies when I give cooking classes. Even though I tell them I didn't make it, they keep asking me for a "recipe". Looking at your directions, it's time intensive and consuming. My philosophy is to focus on quick, easy, one-dish, weeknight meals. So, ready precooked is a perfect option for busy people. But, I'll have to give folks who want to do it your recipe. Thanks. Can u advise where u bought ur 6 Quart Lodge Dutch Oven? I just ordered the 6 quart Dutch Oven at Walmart.com because I love soysauce chicken. I plan to give this recipe a try next weekend. Your chicken looks delicious. Wow, you're so keen. Let me know how it goes if you make this dish. 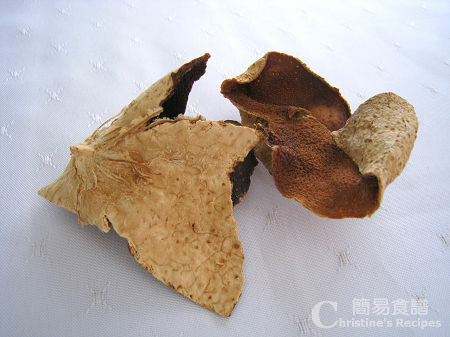 i'm making this at the moment, but the chicken skin all stuck to bottom of pot. Hi Christine, thanks for this recipe! It was yummy! We have quite a bit of soy sauce leftover still. Can you let me know how long I can store it in the fridge? Thanks! The leftover soy sauce can be kept in fridge up to one or two weeks. It is always patchy! Even after constant basting! Could it be the breed of the chicken itself? Chicken skin contains oil. If the skin is thicker, that means it contains more oil. It will prevent the skin from being evenly tinted. You might try briefly rinsing the chicken with hot water. Don't cook the chicken anyway. 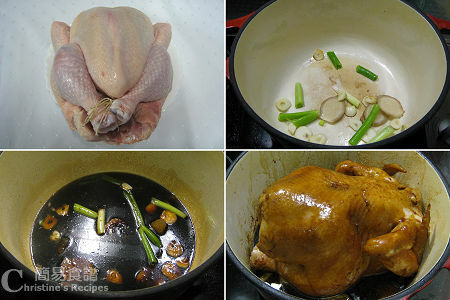 The idea is to rinse away as much oil as you could in order to help the chicken skin absorb nicer soy sauce colour.